The other day I saw this picture and I laughed out loud. I mean clearly this is a picture of a smart dude. This guy is one of the greatest theoretical scientists like, ever. There is no doubt that his contribution to science is epic. 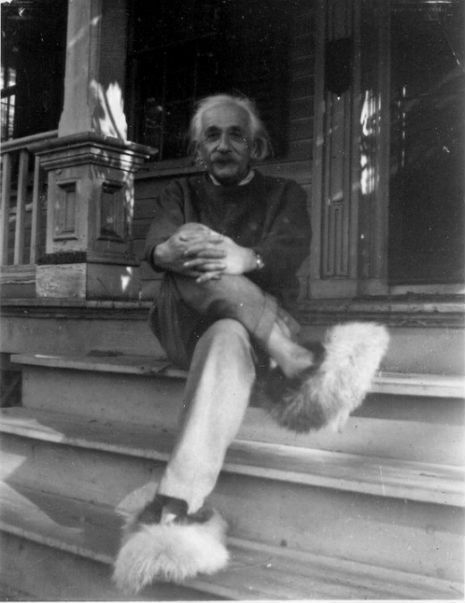 But here he is wearing big, fluffy, fuzzy slippers and clearly having a bit of a laugh about himself. And I thought, yup Einstein was a smart guy. He was even smart enough to laugh at himself. And it made me think. I used to laugh at myself all the time. I used to wear big floppy hats in public and sing out loud in convertibles and dance on the sidewalk and wear men’s clothing sometimes just for the heck of it. I dared the universe to look at me funny. I just did what I felt like and told the world they could like it or lump it. But somewhere along the way, I think I got a little too serious about myself. I started worrying a lot more about what people might think of me. I bought nice clothes—sometimes because I liked them, but also as protective coloring to allow me to blend in. I got quieter and smaller. I tried to be less a target. But now, as I get older, I’ve gotten bolder. I’ve got pictures of me in feather boas with the words “The Fat Chick” underneath. I wear purple. I smile big. I dance in public. Because I’m learning again not to take myself quite so seriously. I’m relearning how to laugh at myself. So my little chicklettes, I dare you to do something loud and crazy and goofy today! Put on a big floppy hat. Sing out loud in a convertible with the top down. Dance on the beach. Weave flowers in your hair. Feel the freedom of having a little giggle at yourself. This entry was posted in Uncategorized and tagged einstein, emotional intelligence, Fun, go big or go home, laugh, laugh at myself, live large, spontaneous on August 20, 2012 by fatchicksings.